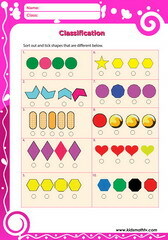 Practice sorting different shapes with this worksheet. Practice differentiating objects, same but different object size with this worksheet. Identifying same objects sorting worksheet. 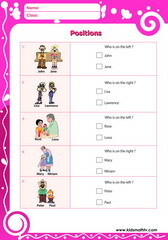 Comparing mixed groups of objects with pictures with this worksheet. Comparing more or fewer objects with dots worksheet. 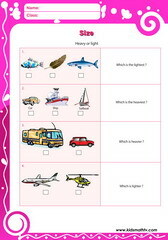 Learn comparing more / few objects on pictures with this worksheet. 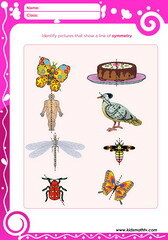 Counting tally marks 1 to 20 with worksheet pdf. Counting objects on a worksheet. 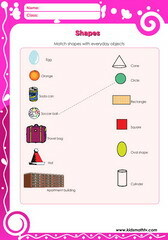 Practice counting stuff in a house with this worksheet. Counting objects on a pyramid worksheet. 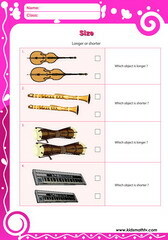 Practice Number 1 worksheet with this worksheet. Practice number 2 worksheet with this worksheet. Practice Number 3 worksheet with this worksheet. Practice Number 4 worksheet with this worksheet. Practice Number 5 worksheet with this worksheet. Practice Number 6 worksheet with this worksheet. Practice Number 7 worksheet with this worksheet. Practice Number 8 worksheet with this worksheet. Practice Number 9 worksheet with this worksheet. Practice Number 10 worksheet with this worksheet. 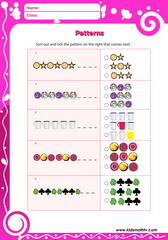 Growing patterns worksheet for kindergarteners. Identifying similar patterns activity worksheet. Positioning objects - inside vs outside activity worksheet. 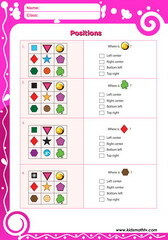 Practice left, right & middle positions worksheet. 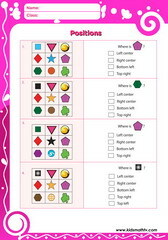 Left vs right positions / spatial sense worksheet. Learn locating in a 3 by 3 grid with this worksheet. Practice locating in a 3 by 3 graph in this worksheet. Learn about top, bottom & middle positions with this sheet. 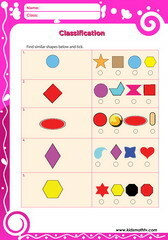 Geometry & Shapes in real life practice for kids. 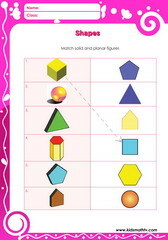 Shapes and geometry worksheets, learn basic shapes. 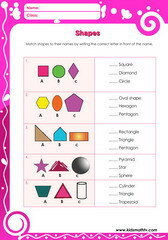 Identify solid figures that relate planar shape with this worksheet. Observe symmetry / asymmetry in objects activity in geometry . Comparing light & heavy objects - which is lighter or heavier ?. Review comparing object sizes, long vs short worksheet. Comparing objects - which is taller vs Shorter. 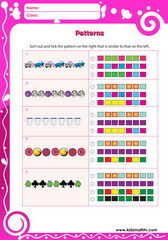 Preschool math worksheets for children to practice early math skills on counting, numbers, positions, time and more. 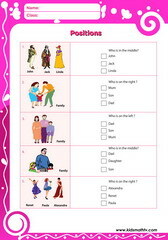 These worksheets are in printable pdf format and are well illustrated with the best graphics and pictures that appeal to children at this age. Remember pre-k worksheets on that page can supplement teaching materials for teachers and parents who need to give their kids extra practice. 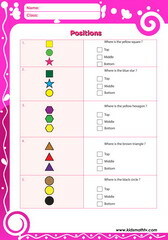 There is a lot to learn about shapes: identify different geometric shapes, on spatial sense learn about position of objects in space, learn how to compare numbers of items, learn about patterns, counting tallies etc.